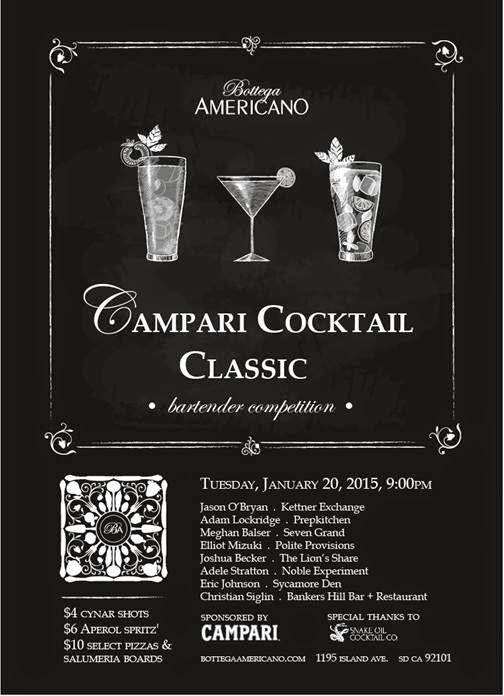 Bottega Americano in San Diego's East Village is set to host the city’s best bartenders in a mixology competition on Tuesday, January 20, at 9pm. Sponsored by the Italian spirits producer Campari, the “Campari Cocktail Classic” will give mixologists from the area’s top bars and restaurants, including Kettner Exchange, Polite Provisions, The Lion’s Share and more, a chance to shake or stir their way through three rounds before being named the best in town. Spectators are invited to watch the action and enjoy food and drink specials. Participating bartenders in the Campari Cocktail Competition include Jason O'Bryan from Kettner Exchange, Adam Lockridge from PrepKitchen, Meghan Balser from Seven Grand, Elliot Mizuki from Polite Provisions, Joshua Becker from The Lion's Share, Adele Stratton from Noble Experiment, Eric Johnson from Sycamore Den and Christian Siglin from Bankers Hill Bar + Restaurant. During the course of the evening, there will be specials on food and drink including $4 Cynar shots, $6 Aperol Spritz' and $10 select pizzas and salumeria boards. Bottega Americano is located at 1195 Island Avenue. For more information, visit bottegaamericano.com.